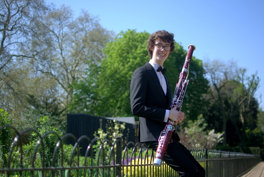 The Foundation panel agreed to donate £5,000 to Ashby, which means he has now raised enough money to buy a second-hand Heckel bassoon… once he finds the right one. Ashby’s search has already taken him to Amsterdam, Wales and Poland. He has tried several bassoons to date, but none has proven to be quite right. “There will be a real gut feeling when I play ‘the one’,” he explained. Ashby Mayes is an undergraduate bassoonist at the Royal College of Music where he is a Douglas & Adele Gardner Award Holder, and supported with the Douglas and Hilda Simmonds Award. He studies with Joost Bosdijk and Sarah Burnett and has played in masterclasses with Ole Kristian Dahl, Julie Price and Giorgio Madolesi. This press release was distributed by ResponseSource Press Release Wire on behalf of Everest Home Improvements in the following categories: Entertainment & Arts, Leisure & Hobbies, Public Sector, Third Sector & Legal, for more information visit https://pressreleasewire.responsesource.com/about.